In this message (which will be structured in three parts) I'll show you some recent discoveries that I've been making while applying the Cipher of the Illuminati to the text of Liber AL vel Legis, the holiest book of Thelema. Please note: I personally don't think that all these discoveries actually "prove" any claim presenting this cipher as some kind of "key of it all". I wrote this just to show you what I have found, and it is up to all who read this to extract from it their own opinions. In the meantime, as I presume some of you may be interested in this subject, I'll leave here a very curious discovery made near to March 5th. Watch the Holy Sigil of the A.'.A.'. In it you can see the sigil of Babalon hiding the formula 77+(7+7)/7+77 = 156 (Babalon) which circles a form that resembles the greek letter Theta (Θ). Also, in the upper part of the sigil, you can see a "squared circle", which is a primitive form of the greek letter Theta and the hebrew letter Teth. Theta is the initial of the words "Thelema" (Will) and "Therion" (the Beast), and it was also --in its primitive shape as a point within a circle-- the symbol of Ra and Aton, demiurgic solar gods. In the greek isopsephia, the value of "Theta" is 318, which is the value of "Helios", the Sun. As a side note, notice that according to the Illuminati Cipher the word "TETH" sums 51, which has the same value as "CIRCLE", "SUN", "HELIOS", and "PTAH" (egyptian creator god). And by the way, according to the Illuminati Cipher, "Point within a Circle" sums 194, which is the value of "Great Central Sun". 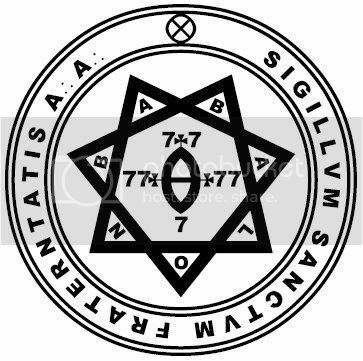 Besides all these considerations, which can be expanded to a greater field, notice too that all around the central Sigil of Babalon there are the words Sigillum Sanctum Fraternitatis A.'.A.'. These words are important, as it will be shown. Amazingly enough, 343 is 7x7x7, and this is curious --to say the least--because there is, as seen, another very explicit numerical reference to multiple 7's. 418, the qabalistic value of the Word of the Aeon (Abrahadabra)!!! And now, as promised, here's some of the stuff I've been finding lately about a curious relation between Liber AL vel Legis and the Illuminati Cipher, and how it unlocks some of the riddles in this book. Unless stated otherwise, every time I say "the Cipher" I'll be referring to the Illuminati Cipher. – "I am Nuit and my word is six and fifty." According to the Cipher, "Nuit" sums 56. – "Change not as much as the style of a letter; for behold! thou, o prophet, shalt not behold all these mysteries hidden therein." – "The child of thy bowels, he shall behold them." Note that in the original manuscript of Liber AL Crowley underlined the word "he" so as to show that this word is of some importance. Applying the Cipher to this word, it's value is H(5) + E(8) = 13, which is the gematric value of the hebrew word Achad (Unity). Charles Stansfeld Jones, a.k.a. Parzival or "Frater Achad" as he's most known nowadays, was believed by many, including by Crowley himself, to have been the magical Child of the Beast 666 and the one who would reveal --and did indeed reveal to a certain extent-- some of the mysteries of AL. – "Come! all ye, and learn the secret that hath not yet been revealed. I, Hadit, am the complement of Nu, my bride. I am not extended, and Khabs is the name of my House." – "In the sphere I am everywhere the centre, as she, the circumference, is nowhere found." AL I:8 – "The Khabs is in the Khu, not the Khu in the Khabs." – "Thou shalt obtain the order & value of the English Alphabet; thou shalt find new symbols to attribute them unto." Even though, as far as I know, there isn't any direct reference to the Illuminati Cipher in this verse, it should be noticed that this cipher indeed answers this purpose. There is a peculiar order for the letters in the Cipher, according to their value, and also a set of symbols that correspond to the alphabet. However, interestingly enough, "Illuminati Cipher" = 140 = "English Alphabet". 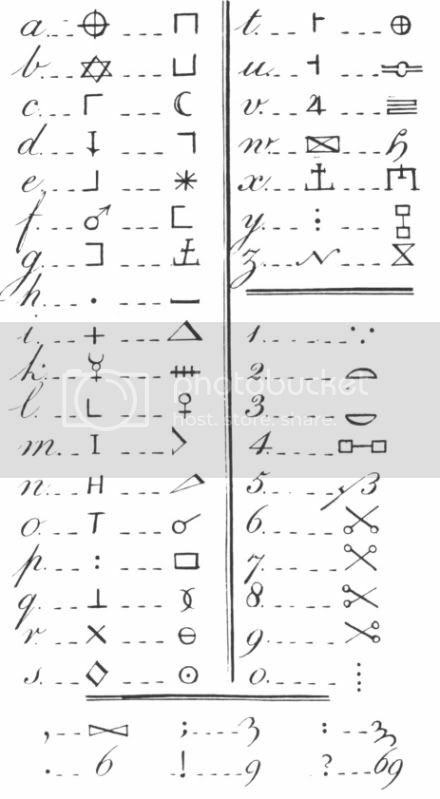 Replace "English Alphabet" by "Illuminati Cipher" and the text remains logical! – "Aye! listen to the numbers & the words:"
– "4 6 3 8 A B K 2 4 A L G M O R 3 Y X 24 89 R P S T O V A L. What meaneth this, o prophet? Thou knowest not; nor shalt thou know ever. There cometh one to follow thee: he shall expound it. But remember, o chosen one, to be me; to follow the love of Nu in the star-lit heaven; to look forth upon men, to tell them this glad word." I've tried to get any kind of clue to solve this riddle by using the Illuminati Cipher but, unfortunately, the result has been completely unsatisfactory. Anyway, if you add the values of the numbers and the words you'll get 383, which is the 76th prime number (the number of the verse in which the riddle appears). Also, half 76 is 38, which resembles the total of the riddle, 383. This is all I've got so far, but I doubt it has any "practical" meaning at all. – "Abrahadabra; the reward of Ra Hoor Khut." "Abrahadabra" = 130 = "Ra Hoor Khuit", and also "Book of the Law". Using Ra Hoor Khut, it's value becomes 126, which is the same as "Ankh-f-n-Khonsu" (the Scribe of the Stele of Revealing). – "The other images group around me to support me: let all be worshipped, for they shall cluster to exalt me. I am the visible object of worship; the others are secret; for the Beast & his Bride are they: and for the winners of the Ordeal x. What is this? Thou shalt know." It is commonly thought that the Ordeal X refers to the experience of Crossing (X) the Abyss, where the Adeptus Exemptus faces the "demon" Choronzon and either is able to "spill every drop of his blood into the Chalice of Babalon" (that is, to overcome dualism and sacrifice one's attachments to fear, desire, hate, indiscriminate love, power, and even all worldly possessions) thus becoming a Master of the Temple, or he fails to do so and becomes a "Black Brother", who acts according to the choronzonic principles of Restriction and Dispersion. In the Tree of Life, the Abyss is represented by Daath, the "non-sephirah" which corresponds to Knowledge. The Illuminati Cipher sheds some light on this, as "Ordeal X" sums 84, which is the value of "Knowledge" (=Daath). – "The half of the word of Heru-ra-ha, called Hoor-pa-kraat and Ra-Hoor-Khut." If we use "H.P.K." for Hoor-pa-Kraat and "R.H.K." for Ra-Hoor-Khut, we'll see that HPK + RHK sums 48, which is *half* the value of "Heru Ra Ha" (96). – "This book shall be translated into all tongues: but always with the original in the writing of the Beast; for in the chance shape of the letters and their position to one another: in these are mysteries that no Beast shall divine. Let him not seek to try: but one cometh after him, whence I say not, who shall discover the Key of it all. Then this line drawn is a key: then this circle squared in its failure is a key also. And Abrahadabra. It shall be his child & that strangely. Let him not seek after this; for thereby alone can he fall from it." 1) the initial of the words "Thelema" (Will) and "Therion" (Beast), and of several other equally interesting greek words. Also, the value of the name of the letter Theta (Θητα) is 318, the value of Helios (Ήλιος), the Sun, and the Lord of the Aeon (RHK) is, as Crowley calls him, a Solar-Phallic Deity. 2) the mystery of Babalon and the Beast conjoined. This is shown in Atu XI, "Lust", which corresponds to the hebrew letter Teth and depicts the Scarlet Woman holding a Chalice and riding a 7-headed Beast. Also, notice that in this card, the tail of the Beast is in the shape of the gnostic symbol of the Lion-Serpent, or the Demiurge, the Solar-Phallic Force of Creation. -> "Then this line drawn is a key:"
In 1989, Gerald Suster explained a very simple way to decode the riddle of AL II:76, by using this little sentence as a clue, and this was published in the journal Nuit-Isis. I would recommend you to read George T. Mortimer's excellent book "The Key Of It All", which is available online, in order to better understand how Gerald Suster's intelligent solution works. Anyway, the most important part of it is that by using the "line drawn" in the manuscript of Liber AL (which goes from the letter C to the line corresponding to 7) and creating a new cipher with it (in which C=7, D=8, ..., V=26, W=1, X=2, etc) the sum of the values of all the numbers and words in AL II:76 is 419, which is the value of the letter Teth written in full (TYTh = 9+10+400 = 419). -> "then this circle squared in its failure is a key also." It is a "circle squared in its failure" because it is a circle *almost* squared: the four ends of the “X” aren’t connected to the circumference. If the circle was perfectly squared, it would be similar to the early form of the letters Theta (greek: Θ) and Teth (hebrew: ט), and thus synonymous with the Point within the Circle. And Abrahadabra! Very effective clue! In hebrew, the value of Abrahadabra is 418 which is one less --"one to follow thee"!-- than 419 (the value of Teth written in full). – "I am in a secret fourfold word, the blasphemy against all gods of men." – "Curse them! Curse them! Curse them!" The secret fourfold word is Θητα, Theta (4-lettered in greek), which is the blasphemy against all gods of men because it represents the Point in the Circle, the Lord of the Aeon, and the Word of the Law ("Thelema", beginning by a greek Theta). Besides, the three sentences in AL III:50 (3x "Curse them!") have a total value of 318, according to the Illuminati Cipher, which is the value of Theta written in full (Θητα), according to the greek isopsephia. 180 plus 138 equals 318, precisely the value of the letter Theta written in full. These have been the most important discoveries that I've made with the Illuminati Cipher while analyzing some passages of Liber AL vel Legis, but any other major discovery will, of course, be posted online too. In the meantime, any kind of comment, correction or whatever feedback you wish to send, will be most appreciated. 169 = "Hoor Paar Kraat" = "Annuit Coeptis" = "E Pluribus Unum" = "Eye in the Pyramid" = "Eye in the Triangle" = "Illuminati Bavaria"
"Novus Ordo Seclorum" = 229 = "The Equinox of the Gods"
"Great White Brotherhood" = 252 = "United States of America"
H.G.A. = 23 = H.P.K. Ala'aster-a-dekerval = 191 = Aleister E. Crowley = Argenteum Astrum = "Number of the Beast"
"Priest of the Princes" = 219 = "Threefold Book of the Law"
"Crowned and Conquering Child" = 277 = "I am alone: there is no God where I am"
Aiwass - An alias for Crowley? AL I:7 - "Behold! it is revealed by Aiwass the minister of Hoor-paar-kraat." So 'Aiwass' is the minister of Hoor-paar-kraat (that is, Harpocrates, the egyptian child god that represents Silence). This identification of Aiwass (= Baphomet / Sorath / Beast 666) with the "minister of Hoor-paar-kraat" could throw some light on the true identity of Aiwass, and indeed it does! This means that not only can Aiwass be identified with Crowley and The Beast 666, but his office as "minister of Hoor-paar-kraat" confirms this identification. The Book of the Law was dictated by Aiwass, who was Crowley himself! The name Hoor-paar-kraat is interesting too because it sums 169 (13x13) and one could conclude that the "Hundred and Sixty-Nine Cries of Adoration and the Unity thereof" in Liber CMLXIII ["The Treasure House of Images"] were directed to Hoor-paar-kraat himself! Also, 169 is the value of "Eye in the Pyramid", "Eye in the Triangle", "Annuit Coeptis" and "E Pluribus Unum" (these last two can be seen in the Great Seal of the United States, in the 1 Dollar bill), and also, curiously enough, "Illuminati + Bavaria". 93 = "True Will" = "Divine Self" = "Kristos" = "Sun + Moon" = "Circle + Dot" = "Pineal Eye" = "Third Eye"
Harpokrates wrote: There is a peculiar order for the letters in the Cipher, according to their value, and also a set of symbols that correspond to the alphabet. Remember that the numerical cipher was shown in the first post, so now you have both ciphers presented here. "I was born to rock'n'roll, everything I need. I was built for speed." Yes, I've read something about that cipher, concerning David Hulse's answer to AL II:76 and Wizardiaoan's own reformulation of Hulse's solution. It is indeed a very simple way to answer the riddle, but I doubt if the "SATOR Square" bit does indeed "mean" anything in the context of Thelema and the Aeon of Horus. After all, the Mars (Geburah/Horus) Square is not the SATOR square but a magical square – filled with numbers from 1 to 25, not letters. On a personal level, I would attribute the Sator Square to Saturn, since SATOR is a latin word meaning "Sower" and the etymological root of SATURNUS (Saturn, ancient god of sow and harvest, later to be considered a personification of the all-devouring Time, and later yet, of Death itself). This is the origin of the "Grim Reaper" figure, as well. Still studying your previous posts. I've been watching the symbol of Temple of Thelema in Facebook, and found something that you may find curious. In this image there is the radiating All-Seeing Eye above the number 56, and below that there is an image of Kheper – the egyptian symbol of the morning rising Sun as a winged Scarab – holding a Circled Dot, a traditional symbol for the Sun. Also, below the scarab Kheper there is the traditional number 93. All the elements in the image are encoded by the numbers it shows! Does anyone know how old this symbol is? The reason I ask is my grandmother had a portrait of something similar, without the number, and color. Her great grandfather was up in the Masons in Indiana. It was Phyllis Seckler's personal lamen. It is no older than 1952, and probably closer to the early 1970s. I don't believe it was ever shown in the public until 1973. Harpokrates ... That Sigil of the A.'.A.'. that you posted has a typo. Yeah, but he added in the forgotten "I" (the typo) in his calculations. But I'd say continue to be very careful and watch out for this version of the seal. It's very dangerous in that it could lead to inconsolable tattoo-regret.